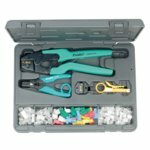 Tool kits for the twisted pair installation: die sets, tool frames, wire strippers, punch down tools, etc. Blowing Case: 340x250x65 mm (O.D. 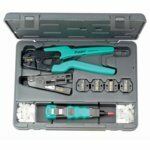 ), Multi-function wire strippers, Supercrimp crimp tool frame, Multi-function wire strippers. Case size: 340x250x65 (mm) The contents list is available at "Detail"